When we hear the word frost, we automatically think of winter and cold temperatures. For some, that's not a great thought! However, our frost mini lights create anything but a cold atmosphere; but instead bring a softer, more subtle light to the party. These lights offer a whole new set of possibilities when it comes to decorating! 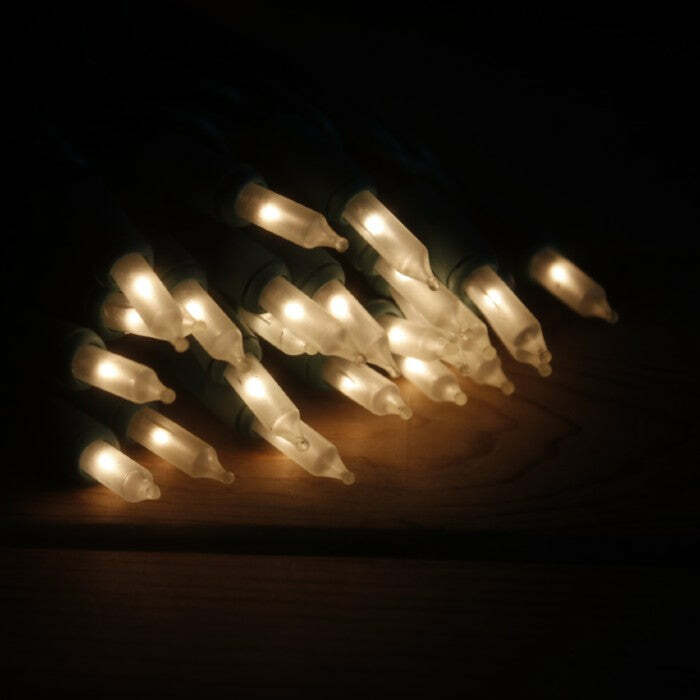 Consider using our frost mini lights to decorate your offices for the holidays. Small holiday trees, wreaths, cubicles, and desks will look festive and fun when draped or wrapped with these pretty lights. Make your associates feel welcome when they arrive to work by lighting up the hallway or entrance to the office with frost mini lights. And, what would an office holiday party be without lights? Make the buffet or dessert table sparkle with our frost mini lights. Welcome customers and clients to your place of business by using frost lights on the ceiling, the walls, window displays, in dressing rooms, and in/around merchandise. Shops that cater to women would be especially successful in creating a beautiful place for the ladies to shop. Your customers will be drawn in and want to stay awhile, browse, and make purchases; isn't that what you want them to do? Create a romantic atmosphere at home by placing frost mini lights in a group on the sideboard in a clear bowl or inside a glass hurricane. Combined with candlelight, the room will be absolutely irresistible for dining and enjoying a glass of wine with your loved one. Frost mini lights on white wire would be perfect for decorating a baby's bassinet as a baby shower "display". Wrap white columns in a wedding reception or banquet hall with white tulle and our frost mini lights for a truly romantic and inviting atmosphere. An ice sculpture will go from beautiful to stunning when surrounded with strands and strands of frost mini lights on white wire. Mix up the color scheme a bit for your Easter celebrations by twisting together frost mini lights with mini lights in colors of pink, purple, yellow, or green. These intertwined colors will look great swagged on a fence or draped across the front of shrubbery. It's easy to create a snowy look over bushes and shrubs by using several strands of frost mini lights on green wire. String the lights over the tops of the bushes and around the front and sides, creating a "blanket" of light. This is especially neat during those cold winter evenings when there isn't any snow to be seen on the ground. Soft light from our frost mini lights would be just the right accent for meeting rooms, quilt shops, fair exhibits, nursing home common areas, or physicians' waiting rooms. Frost mini lights on green wire can easily be used out of doors to bring light and beauty to a garden, fountain, pond, patio, balcony, or porch. Surround the base of your indoor artificial plants and trees with strings of frost mini lights to add warmth and coziness to any room. Really, there are so many applications for these beautiful mini lights!